Ok, Now I know it’s not the newest handset in the range, however I received the N95-8GB from WOM today for 2 weeks. At the moment, im currently using a N82. I have to admit, for some reason, I dont get the same “kick” out of the N82 as I do out of the N95-8GB. When I got the package, I opened it , I got a nice warm feeling in my stomach. Its not that I haven’t seen a N95-8GB before, because I have, many times, its just when you get your own to play with for a couple of weeks, its always better. I started using it and I just felt at home. The big screen, the nice keys, the well build casing. I was sat at my desk using it, and I thought to myself, this phone sums up Nokia completely. Its what Nokia do best. Its why I love Nokia phones and why I would never buy a Sony Ericsson or a LG again. Its just a Joy to use. Ok Its not perfect. The transfer speed is slow when using the computer, no MicroSD card slot (I have a 8GB card, so I usually just slot it into the phone and I automatically have all my info on it) and the camera isnt the best due to the poor flash (well compared to the N82 anyway) but I think this is just about as near to perfect as a phone can get. Seriously, so far, I have very very few things to fault about it, and the faults are not really faults, they are just things that could do with improving (eg the card slot issue and the LCD flash). The screen is one of the nicest screens I have seen on a phone, and from using my N82 to the 8GB, its a huge difference in size. Every time I pick up my N82 after using the 8GB for a short time, I feel like im staring into a small hole. Its so dark and, well, lifeless compared to the 8GB. Now your probably wondering where this is going. Well, for a start its got me ALOT more exited about the N96. I know I said the things below about the N96, but after using the 8GB for only a day, I CANT WAIT to get my hands firmly on the N96 and compare them. Hopefully, if I ask them kind enough, WOM would let me Beta test the N96 if they need some people and I can get my grubby mits on it soon :). 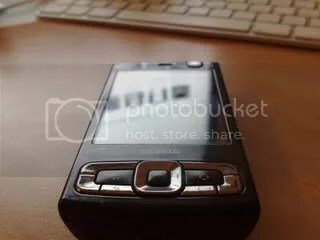 In fact, I love the N95-8GB so much, Im starting to think about getting one to replace my N82. I’m very pleasantly surprised with N95-8GB. I didnt think it would be a huge improvement to the original N95. OH how wrong I was…. Also, Im going to try and arrange another podcast with Jay and maybe James Burland from Nokia Creative soon to discuss the new Nokia Launches. Hopefully it will be a bit better and more professional then the last one, so keep your eyes peeled for that. « Nokia Launch N78 and N96: Was it worth the wait?